On November 2, 2012, Quantum Leap Farm will be hosting their 12th Annual Charity Golf Tournament at Feather Sound Country Club in Clearwater, Florida. 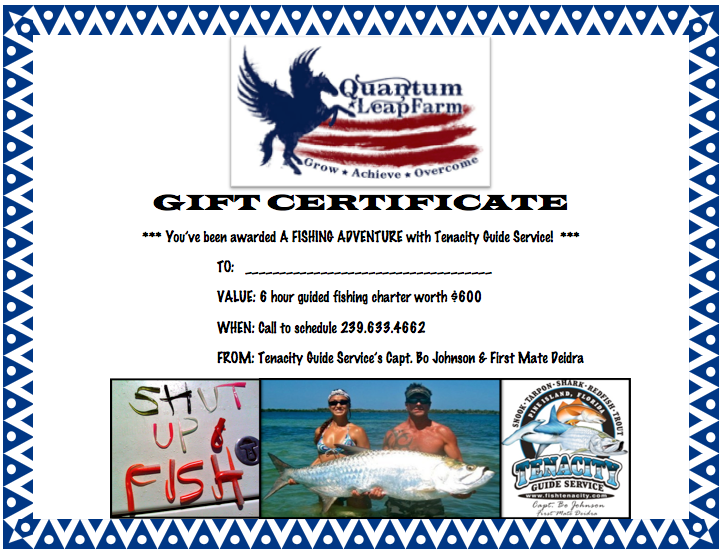 Tenacity Guide Service is excited to donate a 6 hour Fishing Charter (a $600 value). Quantum Leap Farm is a 501-(C)-3 Charity: a nonprofit community service organization providing therapeutic and recreational horseback riding, carriage driving, equine co-facilitated mental health services, and a variety of equine experiential learning programs. Founded in 2000, is one of only a handful of equestrian programs nationwide serving disabled civilian adults, military servicemen, and their families.